Thick smog covers the city of Athens on June 19, 2008. Air pollution in Athens has surged in recent days because of people choosing wood over more expensive fuels to heat their homes in the grips of a continuing economic crisis, the environment ministry said. 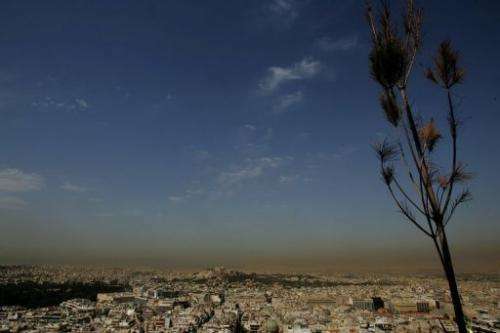 Air pollution in Athens has surged in recent days because of people choosing wood over more expensive fuels to heat their homes in the grips of a continuing economic crisis, the environment ministry said Friday. Particulate matter has been measured at 150 milligrammes per cubic metre, or three times the danger level, especially in the northern and western suburbs of the Greek capital, the ministry said. The visible smog is reminiscent of that which cloaked the mountain-ringed city before it modernised its cars and buses. "The smog, which appears especially in the evening, is made up of polluting and dangerous particles that can cause respiratory problems," said Evangelos Gerassopoulos, director of the Environment Institute of the Athens Observatory. "This polluting cloud is the result of the combination of a lack of wind and the burning of wood, which is more prevalent than usual because of the high price of domestic heating fuel," Gerassopoulos told AFP. The smog contains sulphur dioxide, carbon monoxide, and other carcinogens, he said. Almost everything is a carcinogen. Man's average expected life span has gone up considerably since the discovery of fire, and has doubled again since the industrial revolution. Oxygen actually causes cell death. Maybe they should ban Oxygen. The government is looking for a way to start taxing wood, pellet and other resources used for alternative heating in Greece. It's not bad enough that they have taxed heating oil to the point where no one is buying, it's not enough that they increased the cost of natural gas, now they want more. The government is run by children with grade 4 level education and the only thing that they know they are doing is destroying the people and the country. Sounds like someone has cut off YOUR oxygen. Oxygen does cause cell death, it's one of the biggest hurdles in using human cryo-hibernation. However, I was being sarcastic ab out the second sentence, which you didn't pick up on that. But am I to assume that you are against sensible wood burning regulation? We DID clean up car exhaust pipes (so why not chimneys?) I feel that wood should not be burned in crowded cities, due to public-health issues. Out in the open country, that is another matter. This is what happens when economies collapse. This is exactly what happens if the AGWite agenda is imposed, economies decline and people burn what ever they can. It doesn't help that Athens and other major cities sit is valleys which have temperature inversions in winter trapping the air. How abundant is the supply of wood? Delimit the problem. Biomass = Renewable and Green. Why does physorg publish these anti-green hate screeds? Not really. Trees don't grow fast enough to be a renewable energy source in the modern world given world population. That is, not for the entire population anyway. They'd only be renewable if no more than about 2 or 3 percent of world energy came from burning wood. Over the long term, you may as well have solar PV or concentrated solar in the place of the forest you're cutting and re-cutting. Futher, it appears using some sort of solar plant and an electro-chemical process powered by it would actually be more efficient per unit area at converting CO2 back to oxygen than would be plants, in some cases. Sugar Cane converts carbon dioxide, sunlight, soil, and water into sugar. It would be nice to have a synthetic version of this process which works cleaner, with less waste, and can be contained in large flasks or tanks, powered by solar energy. Some of the solar-diesel schemes attempt something like this, but don't seem efficient enough to me. "Drax Group Plc (DRX) received 100 million pounds ($163 million) from Britain's Green Investment Bank to fund its $1 billion plan to convert the nation's biggest coal- fired power plant to burn wood pellets." Because, while the process may be carbon neutral for wood, burning it (or any other hydrocarbon fuel for that matter) is never a perfect process. You always create some CO and NOx compounds as well as some sulfur containing molecules. All of which are toxic to some degree. Larger powerplants can optimize the burning and filter out (most of) these pollutants but home heaters and stoves aren't equipped for that. Spoken exactly like someone who knows nothing about chemistry and evolutionary Human History. Lots of essential minerals, nutrients, and compounds are toxic in large amounts and you are just completely wrong in your statement about continually improving life expediency since the discovery of fire. Really, really wrong. We took a huge hit after the advent of agriculture and by some measures still haven't recovered from it. "Far from being "carbon neutral," wood-burning biomass actually emits more carbon dioxide (the primary global warming greenhouse gas) per unit of energy produced than either gas or coal. Yes, trees can grow back and reabsorb that carbon, but that growth takes many years. The most recent studies show that it takes at least 40 to 50 years for re-growing forests to pay back the "carbon debt" created when trees are cut and burned for electricity. The renewability of wood is also questionable, as forests would be threatened by any meaningful increase in electricity generation using biomass as fuel. Replacing just 10 percent of the coal used in Pennsylvania would require more than 12.8 million green tons of wood per year -- far more than the state's annual commercial wood harvest (about 5 million tons)." "The hype around biomass energy also diverges from reality when it comes to air pollution. Burning wood produces the same pollution that burning anything else does -- including particulate matter, nitrogen oxides, volatile organic compounds and carbon monoxide. Utility-scale biomass electricity plants that employ modern emissions controls still emit tens to hundreds of tons of these pollutants per year. However, many institutional burners are too small to be covered by federal regulations and employ only minimal emissions controls, making their pollution impact disproportionate. Our report found that as permitted in Pennsylvania, a school-sized biomass burner is allowed to emit more than seven times the particulate matter of an oil burner, and total allowable particulate emissions are similar to having more than 10 wood stoves venting "
I'd be the last to argue that burning wood is the best solution for getting energy. That said it is still infinitely better than burning coal, oil (or using nuclear - but that for different reasons). So when people make a decision on what to use for heating purposes then there is no completely pollutant free way. That something isn't optimal doesn't mean that people should turn to the old ways which are much worse, though. Long term burning wood is sustainable and completely carbon neutral. What burning wood (or biogas) is not is being POLLUTANT neutral (the NOx in the atmosphere isn't taken back up by regrown trees...at least not directly), and that's why it isn't the energy source of choice when talking about alternative energies but just a supplemental source to be used when the others (wind, sun, hydro) aren't available. It's only an alarm because the pollution is actually visible. That's the problem with people. They'd be standing on the side of their still idling car inhaling the sweet scent of its exhaust , not caring about the chunk of radioactive americium-241 from the broken smoke detector by their feet while licking a piece of lead from their key holder but they're too worried about someone that's having a cigarette producing an obvious lingering smoke. Ignorance is absolutely not bliss. Wood produces 50 to 100% more CO2 than coal for the same amount of energy produced. "Carbon Neutral" is just a con game. If the Greeks consider it expedient enough to use wood for cooking, heating water and keeping warm in the cold weather, who are we to condemn their burning wood? They have to make the choices between being cold and being comfortable; washing dishes and bathing in cold water or having hot water. Chinese cities have been reported to have a bad air pollution problem from coal-fired power plants...remember that? Pictures were shown of Chinese citizens wearing face masks. The Greeks will need to do the same..
American Indians living in long houses or tepees would burn wood or buffalo chips in the middle of their tepee so that the smoke would go up and out of the hole at the top. They suffered lung diseases from smoke inhalation but had no alternative to burning those types of fuel. The Greeks have endured for thousands of years, and I'm sure they will survive this also. ...which is carbon that was captured from the air initially. Ah. now I think I understand the problem. You guys don't know what 'carbon neutral' is supposed to mean. The term 'carbon neutral' means that over the whole cyle (growth of the tree and burning of same) the amount of carbon in the atmosphere stays the same to the point where you can repeat the cycle indefinitely without net CO2 gain. The term was coined to distinguish it from non-carbon neutral fuels (those that take sequestered carbon - like coal, oil or natural gas) and release it into the atmosphere as EXCESS carbon. It is the accumulation of EXCESS carbon that is causing the problems we have with the climate. Not the continual recycling of what was already there to begin with. If you want to redefine that then you're the only one that uses these nonsensical definitions. Try telling that to someone who's unemployed - that instead of burning wood from a nearby Tree to keep themselves warm they should instead install a 1000$ Solar Array which will magically generate electricity in the Deep winter. They're just looking to survive the winter. On the other hand these people are reaping exactly what they sowed. Electing socialist governments who spend like there's no tomorrow when the times are good , mostly on useless causes and for vested interests. Now that the Greek economy is broke because of past sins , they'll probably follow in the footsteps of Argentina. We took a huge hit after the advent of agriculture and by some measures still haven't recovered from it. 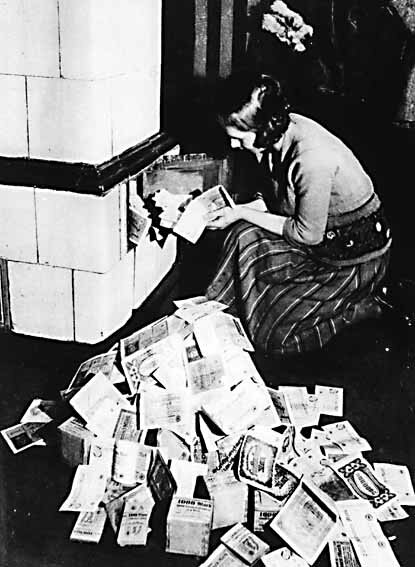 If the ECB keeps the printing presses going, they'll be burning euros before long. Wood produces 2% more carbon per unit energy. I was talking about long term. You would make the extra fuel you need during the summer using solar, and store it till winter. I suspect northern European tribes eventually dominated the southern Euros because they had to plan and prepare for real, cold winters to survive. Consider that wood is a carbo-hydrate with empirical formula of CH2O. Even completely kiln-dried wood (zero percent free moisture) is 60% 'water' by molar mass. And water does not burn --- only the wood molecule's CARBON actually oxidizes, producing heat. This is why wood is the worst type of fuel you can use, thermodynamically speaking.